Bearded dragons make excellent reptile pets. With one of the best temperaments of all lizards, they are generally docile, and many seem to actually enjoy being handled. They are diurnal (up during the day and sleep at night), which means you can watch them during the day. They will watch your every move, sometimes pacing their tank as if begging for attention and to be fed (they love to eat!). Their spikes make them look like dinosaurs, however, they are usually quite tame and easy to handle. They can even make good pets for children, if properly supervised, and their relatively small size makes them very manageable. Bearded dragons vary in their personality. Some are more personable and responsive than others. Some show more signs of intelligence than others. When first born, baby bearded dragons are just under 4 inches in length and weigh about 1/10 of an ounce (2 1/2-3 grams). Adults typically are 19-23 inches and weight at least 3/4 of a pound (250 grams). The German giant morphn type can reach up to 26 inches in length. Bearded dragons are often kept in a glass aquarium tank with a screen top. Other housing that is sometimes used are custom wood cages (which can be hard to clean), cages made from molded plastic, which can be pricey but they are lightweight and easy to clean. You can start a baby for the first 4 to 6 months in a 30-inch long enclosure. Keeping a baby in a larger area can sometimes cause problems as the baby may have a hard time finding his food, water, basking sites and shelters. As the baby grows a larger area will need to be provided. The smallest enclosure for one or two adult bearded dragons is either a 4-foot x 2-foot tank or a 6-foot x 18-inch tank. A single adult should not be kept in a tank smaller than a standard 55-gallon (48-inch x13-inch) tank. 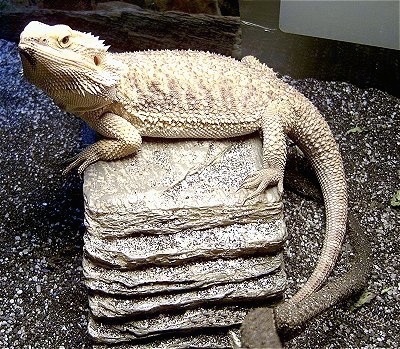 Anything smaller will restrict activity in a way that is not healthy for the beardie. Wood chip bedding is not always recommended as the crickets will find places to hide, making it difficult for the beardie to find its food. These hiding crickets will then come out during the night hours while your beardie is trying to sleep, harass him and stress him out. Sand or fine gravel is a good alternative. Sand and fine gravel are not only their natural desert bedding but are also easy to keep clean. Poop can be scooped out in clumps. A layer between 2 and 3 inches is recommended. Some also like to use newspaper or even rabbit pellets or alfalfa pellets, but you must watch so that it doesn't mold if it gets wet. Cage carpet can also be used. It can be taken out and washed over and over. If you choose to use cage carpet be sure there are not loose ends that can be ingested. Bearded dragons need a source of heat. Some choose to use a heat pad, however beardies like to bask in the sun and a heat lamp provides a good replica of the sun. If you place a rock under the lamp, the lamp will also heat the rock which will also warm up the dragon’s underside. A basking light should be provided at one end of the cage. Bearded dragons are primarily desert dwellers, however, they do spend the hottest part of the days in relatively cool areas; as with all desert animals, too much heat can be just as dangerous as too little. During the day the temperature should range from 76° F (24° C) on the cool side to 86° F (30° C) on the warm side, with a basking area ranging from 90-100° F (32-37.7° C). Nighttime temperatures should drop no lower than the low to mid 70s (21° C) on the cool side. It is also recommended that you provide a UV light to help them absorb calcium. UV light activates the synthesis of vitamin D3, which is a prerequisite for the absorption of calcium and other minerals from the diet. 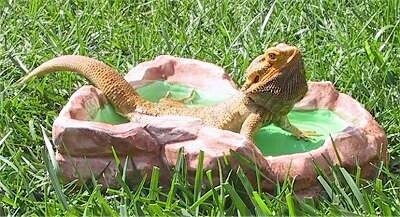 Remember that glass filters out virtually ALL of the beneficial UV rays needed by reptiles for vitamin D3 conversion. Always place your fixtures above the tank, preferably on the screen, to allow the light to pass with no filtering! Keep all lighting and fixtures out of the tank to prevent your dragon coming into contact with the hot fixture and possibly causing severe burns. Your lighting cycle should run between 12-14 hours of light per day, and the use of a timer is recommended. If you choose to put your beardie’s cage near a window for a natural source of sunlight, be sure to carefully monitor the temperature! Bearded dragons should have their cages spot cleaned daily. When using sand as bedding, poop can be easily scooped out. Rocks and any driftwood should be wiped of poop and/or run under water. Food bowls should be washed daily inbetween each feeding. A thorough cleaning should be done weekly. Bearded dragons do not require grooming, however, they will enjoy a shower now and then; a light misting with water will also help keep the skin humidified to make it easier to shed. The tank, however, should never be damp. Bearded dragons should be fed a combination of live bugs and vegetables along with some fruits. Vegetables need to make up a significant part of your dragon's diet: 10-25% for hatchlings and juveniles, 30-50% for an adult. A wide variety is the key, however crickets and dark leafy greens should be two of the main choices especially for babies. The live food consists of commercially-bred crickets, meal worms, wax worms, and juvenile Madagascar hissing cockroaches, which can usually be found in your local pet store. (Yes, this means regular trips to your local pet store for food.) It is not recommended that you catch your bearded dragon’s live food outdoors, such as crickets. Outdoor bugs may have been exposed to pesticides; even if you do not use pesticides, your neighbor might, which may kill your bearded dragon. Green vegetables and fruits can be offered in appropriate-sized pieces, usually finely chopped is best. A good rule of thumb is to chop veggies and fruits no larger than the space between the dragon’s eyes. Leafy greens high in calcium should be offered such as kale, arugula, collard and mustard greens, parsley, dandelion greens and flowers, endives, radish, carrot and turnip tops, escarole and chicory endive. Finely chopped squash, corn, peas, carrots (shredded), sweet potato, cucumber, zucchini, green peppers, chard, chopped fruit such as cantaloupe, apple, blueberries, peaches, pears, grapes, plums, raspberries can also be fed. Avoid spinach—it actually prevents some nutrients from being absorbed. Plants from fields and lawns that have not been treated with pesticides and herbicides can be fed as well. Leaves, blossoms from clovers, dandelion, and mustard are well-liked by beardies. Some types of grass and petals from rose blossoms, hibiscus and calendula can be offered as a treat along with finely chopped fruits such as apples. Citrus should never be given to a bearded dragon. Nor should iceberg lettuce be fed; iceberg lettuce has very little nutrition and may lead to the runs causing dehydration. Some people like to try and feed pellets and/or dog food to their beardies, however many bearded dragons will not eat commercial diets and feeding pellets and dog food may lead to a calcium deficiency and dehydration. All food that is offered should be smaller in width than the dragon’s mouth to avoid choking and blockage while digesting. Crickets and mealworms purchased from the pet store are usually not high in nutrients directly from the pet store. Therefore gutloading is highly recommended. Gutloading means you feed your mealies and crickets a high nutrition diet 24 hours before feeding them to your dragon. Things such as dark greens, oranges, carrots, potatoes for moisture, and a mixture of baby cereal are some examples of things that should be fed to your crickets and mealies before feeding them to your dragon. You can also purchase a product called Gutload from the pet store which is loaded with nutrients that will be passed on to your dragon. Pinky mice can be fed to adult dragons once in a while. Baby beardies should be fed 2-3 times daily. They should be fed as many crickets as they can eat in a 10-minute period. Very small crickets should be a first food for newborn hatchlings. Any uneaten crickets should be removed from the tank. Too many crickets hopping around the cage can stress a beardie out. They may also gang up on and bite the beardie. Beardies are diurnal (up during the day and sleep at night) while crickets tend to be nocturnal. The crickets will hide during the day and come out at night while the beardie is trying to sleep. Always provide fresh water for your dragon. It should be in a bowl or dish shallow enough for your lizard to see easily into and drink out of; deeper bowls can be half-sunk into the bedding. Vitamin and mineral supplements can be offered, being careful not to overload them with vitamins but on the other hand providing an adequate amount. A calcium supplement is usually recommended. Contact your vet to find out the proper amounts to give. If you provide a large enough home for the beardie it should give itself adequate exercise all on its own. About 5-8 years, some have been known to live up to 12 years. Bearded dragons tend to be very healthy reptiles. Given the proper food and care a bearded dragon can live out its life without facing any problems. Listed below are some of the problems that can occur with a bearded dragon. One of the main health problems for bearded dragons is a calcium/vitamin D3 deficiency. Other health problems can include mites, internal parasites, respiratory infections, gastroenteric infections, pseudomona, coccidia, egg-binding, partial paralysis associated with hind leg extension. If you house several baby bearded dragons together with an inadequate food supply available, they may start to nip each other’s tails or toes and fingers. They do not regenerate their tail or their toes or fingers if lost, however infections usually do not result. A male and a female dragon should not be kept together until they're at least 2 years old, and then ONLY if you intend to breed. Before the age of two years a female dragon's bones are not developed enough to lose the calcium and pass the eggs easily. Many times they reabsorb the eggs and you never know they produced them. A few eggs may develop into a cream/yellow color funny shaped things that will need to be passed or may even block up the dragon. Only a female who is 2 years old or older should be allowed to breed. Bearded dragons usually mate around February. Their gestation period is 5 weeks. A couple of weeks before the dragon is due to lay their eggs a cat litter type tray of bird sand and peat with a piece of bark covering the top should be placed in with the bearded. The bearded dragon will lay about 20-30 eggs. The eggs should be incubated at 82 to 84° F for a period of 65-75 days. About 24 hours before the eggs are due to hatch they will start to collapse. Newly hatched dragons should be left in the incubator for a period of 24 hours to allow the yolk sac to be absorbed. Young bearded dragons will usually start to feed within 72 hours of hatching. Babies should be fed very small crickets and very small/hatchling locusts. The Inland Bearded Dragon, Pogona vitticeps, is native to eastern continental Australia, but most of the beardies in pet stores are now captive bred. The name “bearded dragon” comes from the beard of adult males, and the Australian word for this type of lizard. Their color ranges from the "normal" sandy colored tans and beiges to reds, oranges and golds. Live crickets are a bearded dragon’s favorite food. A typical bearded dragon setup: heat lamp on one end and a UV light on the other. The UV lights gives out very little heat, therefore the end with the UV light will be the cooler end of the tank.